Taeyoon Choi presents Distributed Web of Care. WHEN: June 27, 2018. 3:30pm Doors open. 4-5pm Talks + Q&A. 5-7pm Reception. Data & Society’s Databites speaker series is geared toward engaging our network and the broader public on unresolved questions and timely topics of interest to the D&S community. Our annual Fellowship Program supports Data & Society’s crucial ongoing field-building work at the intersection of data-centric technology and society. To learn more about the incoming class of 2018-19 fellows, click here. Jeanna Matthews is a 2017-18 Data & Society Fellow and associate professor of computer science at Clarkson University, where she does research in computer security and leads hands-on computing laboratories including the Clarkson Open Source Institute. 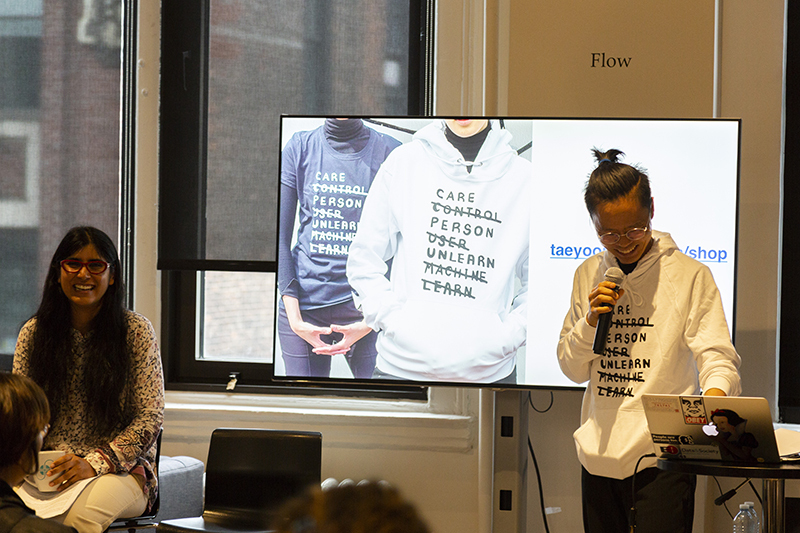 Taeyoon Choi is a 2017-18 Data & Society Fellow, artist, educator, and activist based in New York and Seoul. His art practice involves performance, electronics, drawings, and installations that form the basis for storytelling in public spaces. He co-founded the School for Poetic Computation where he continues to organize sessions and teach classes.